1 in 5 Americans will develop skin cancer over their lifetime. Skin cancer prevention and early detection is very important. The most common types of skin cancer are basal cell carcinoma and squamous cell carcinoma; both are types of non-melanoma skin cancer. Ultraviolet radiation from sun exposure is an important risk factor for the development of these types of skin cancer; both intermittent, intense exposure such as during a summer vacation as well as chronic, low-level daily exposure. Non-melanoma skin-cancer may appear as a new, skin-colored or red bump or raised area of skin or as a red, rough, scaling patch of skin. Skin cancer is most common in sun-exposed areas such as the scalp, face, hands, arms, upper back and chest. Most non-melanoma skin cancers can be cured by early diagnosis and treatment. Adequate treatment depends on the type of skin cancer and the location and include both surgical procedures such as excision or electrodessication and curettage, non-surgical procedures such as photodynamic therapy, cryotherapy and radiation therapy, and topical medications such as imiquimod, 5-fluorouracil, ingenol mebutate and diclofenac. Squamous cell carcinoma is the second most common type of skin cancer. An actinic keratosis is a pre-malignant skin lesion that may develop into squamous cell carcinoma. Melanoma is less common than basal cell carcinoma and squamous cell carcinoma, but more deadly. Ultraviolet radiation from sun exposure also contributes to the development of melanoma, though other factors are important. Although melanoma may develop within a previously normal mole, melanoma more commonly arises on normal skin. It may appear as an irregularly-shaped brown or black mole; a mole that is growing quickly, bleeding or itchy; or a mole that has various shades of brown, black, grey or white within it. Less commonly, melanoma may appear red as opposed to brown or black; these melanotic melanomas may be difficult to detect as they are often mistaken for one of a number of benign skin lesions. Early diagnosis and treatment of melanoma is critical. The initial step in the evaluation of a suspected melanoma is a skin biopsy. If the biopsy confirms a diagnosis of melanoma, the characteristics of the melanoma as noted by the dermatopathologist will determine whether additional evaluation is needed. These characteristics include the thickness of the melanoma as measured in millimeters. Early, or 'thin,' melanomas less than or equal to 0.8 mm in thickness typically do not require any additional evaluation and are treated by an excision of the biopsy site to remove additional skin to ensure that the melanoma is completely removed. For melanomas that are 0.8 - 1.0 mm or greater in thickness, a sentinel lymph node biopsy may be recommended; for melanomas that are greater than 1.0 mm thick, sentinel lymph node biopsy is generally recommended; this additional procedure is performed at the time that the re-excision is performed and serves to evaluate whether the melanoma has spread to metastasized to the lymph nodes. The results of the sentinel lymph node biopsy are used to guide additional evaluation and treatment, including the use of additional therapy. Melanoma often appears as a new or changing brown mole with asymmetric shape, and/or color. Less commonly it may appear as a skin-colored to pink bump. Although melanoma may develop in a pre-existing mole, the majority if melanomas develop on previously normal skin. A dysplastic nevus is a type of melanocytic nevus or mole which characteristically is larger than a normal mole and has an unusual, 'fried-egg' appearance with a more raised, tan-pink center and a fuzzy, darker brown border. 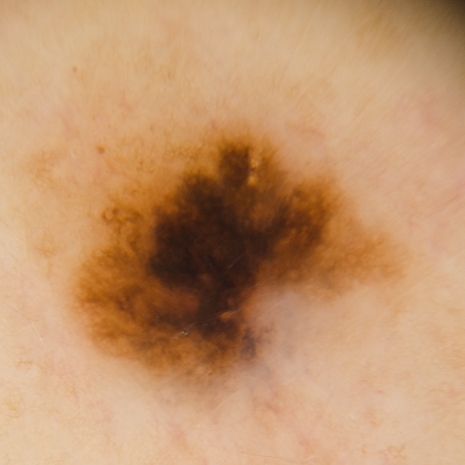 Although a small proportion of dysplastic nevi may develop melanoma, it is not considered a pre-cancerous mole and most do not need to be removed. A person who has many dysplastic nevi is more likely to develop a melanoma as opposed to someone who has no dysplastic nevi.